There is A LOT going on out there right now in the area of Solar Technology, especially since Peak Oil hit it’s peak. The race to find sustainable methods of meeting our energy demands around the planet is ON. Solar is one of a few Renewable Resources along with wind, wave, mechanical and bio-fuels. So long as there is sun we can utilize either its heat or its light to fulfill our energy needs. The solar market is shifting constantly with new innovations so we will explore some tried and true systems that have been on the market awhile for individual consumption, as well as emerging technologies stepping up to become power plants. To create and store solar electricity off the grid you essentially need a form of solar panels, an AC/DC split panel with disconnect switches, an inverter, a charge controller, and deep cycle batteries to hold the charge. The cost usually revolves around the amount of kilowatts a system can generate so it pays to do your math, figure out where you can downsize your consumption or up-size the efficiency of your appliances. Here are the different approaches to going solar on the market today. PVs as Flat Panels can be mounted in a stationary position as arrays directly atop your roof facing the optimal position of the year round sun. Flat panels can take advantage of structures that are already here thus making them ideal for retrofits. They aren’t terribly pretty but they do tend to shed snow quickly. Another bonus is that extra panels can easily be installed into a current system at a later date. The older models are a drag in that seasonally you had to go up on your roof to re-adjust the angle to maximize exposure to the sun. Depending on how difficult it is to access and walk across your roof this can be a pain in the ‘keester’, but like spring cleaning it’s just one of those seasonal chores you get used to doing. A pole top mount can be either fixed, which means it holds the panel stationary, or it can move, or track, with the sun. A solar panel mount that allows the panel to move with the sun is called a tracker. The placement of your panels along with whatever kind of mounting system you are using can make a huge difference in the amount of electricity you are able to produce. Be very careful not to place your panels in an area that is shaded by trees or buildings or any other objects because in the winter shadows can cast at least 22 feet farther to the south and if you place your panels within that distance, you’ll be very disappointed during those short winter days. Solar panels produce the most electricity when they are facing as close to perpendicular as possible. As the sun travels at varying angles throughout the year, you need to adjust the angle to the sun optimally four times a year. The closer to perpendicular they are, the more output you will get. The best dates to change the angles are on February 5th (set to the same angle as your latitude) and May 5th ( set to the same angle as your latitude minus 15 degrees). Some models don’t fair well in extremely cold winters so it’s important to do your homework and make sure the mechanisms don’t freeze on the tracker for 2/3rds of the day until the sun ‘thaws’ the device (you won’t be ‘tracking’ the angle of the sun properly, and rendering this feature useless). 1. The solar potential at the site: What number of sun days does your area receive? What obstacles on your property will prevent your array from receiving the full measure of sun shining down in a 24 hour period? What direction does your home face? 3. Overall system efficiency: Invariably energy is lost when a dc current is run through an inverter to become ac current so everything from the kind of inverter you use to the batteries they are stored in will contribute to the overall rating. 4. Operating temperatures: Most cells perform better when they aren’t overheating. On a hot roof with thin cells you can have up to 15% loss of efficiency due to it’s being directly applied to the roof. With a flat panel on the other hand there is air space and therefore air circulation underneath cooling the panels down. The VREC is a B.C. based organization dedicated to installing renewable energy systems on buildings in greater Vancouver at an affordable cost. They provide services for PV Systems, Solar Hot Water, Solar Hot Air and even have a Sunshare Project that allows business owners to buy a share in a larger solar PV system. To compare manufacturers of PV panels: the website http://www.sunelec.com/ offers an in depth breakdown of how much you are paying per Watt using each manufacturers’ product. Well worth the browse. Need a PV installer in B.C.? Solar Electricity Handbook – 2011 Edition by Michael Boxwell. This book deals exclusively with photovoltaic solar or making power from solar rays.If you’re considering a home solar energy system here’s a book that will guide you through from site selection to system sizing to choosing the appropriate hardware and back up items. A pleasant option to mounting flat panels on tracking systems apart from your house or mounting flat panels on top of the roof is the integration of solar technology AS the roof itself. For a metal roof, Thin-Film PV Laminates are the animal of choice. They are sold in rolls and stick directly to the metal roofing. Sunslates, Thin Film Solar laminates and Roof Integrated Modules are all fine examples of technology being built directly into the building material itself. Solar electric modules made from crystalline silicon have been dominating the market since they first came on the scene in 1954 and continue to do so with their 12-18% efficiency rating of converting solar radiation into electricity. The problem is that this type of silicon is really expensive. Enter thin film solar technologies in the solar race. Thin Film PV Technologies (around since the 90’s) aren’t as efficient (6-11% conversion to electricity) however they are much cheaper (almost half the price) to produce made from amorphous silicon or other semi conductors such as copper indium gallium diselenide (CIGS) and cadmium telluride instead. The objective is to make solar as cost effective as making electricity from fossil fuel or coal. To that end ‘First Solar’ a thin-film PV company in Arizona is going for the big ring…to compete with the utilities companies and supply power on a large scale. We wish them success! On the residential side of things Uni-Solar has been rolling out thin film laminates using ultra thin film solar cells on rooftops for the past decade. They developed a process for bonding the solar laminate to the membrane of roofing used on flat roofs of commercial buildings which makes it crazy easy for all of us to transform every rooftop into a solar collector. In 2009 Uni-Solar hooked up with Certain Teed a manufacturer of asphalt shingles so now we can opt to ‘shingle our entire roof’ with solar panels. Here is a listing of solar panel manufacturers world wide and their warrantees at a glance. Works by collecting light over a large area such as a window pane and then gathers that light at the edges. 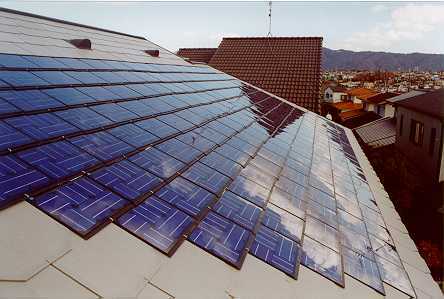 Solar cells are placed only around the edges rather than covering the windows’ entire surface. The secret to the concentrator lies in its unique mixture of dyes which cover the collectors’ surface allowing greater control over light absorption. A solar concentrator reduces the number of solar cells needed to collect the sun’s energy thus increasing the electrical power each cell. Solar collectors work like this. Solar heat is captured by the collector and stored in something like a hot water tank, which then pipes the heated water into the house to be circulated in radiant floor heating, or baseboard, or radiators, or a second hot water tank inside the house. On sunny days you have plenty of hot water. On not so sunny days you need a back up. I suggest hooking up the water to a wood burning stove. Electricity for the purpose of heating water is simply inefficient and an energy hog. So how can the home owner use solar collectors in place of solar panels and why? Simply by separating the function of heating your hot water from the rest of your electrical panel you can have a much more efficient overall energy system. At this time generating electricity from the sun at best is at 18%. Now take that conversion and use it to heat water??? Na uhh. We can use the sun in an entirely different way this time that is a way more efficient conversion of energy to heat (74%) to heat up our water –compared- with using electrical to heat it this is a no brainer. As stated before separating the function of heating water from your electrical panel can result in a system that handles that function with much greater efficiency, and thereby savings. Enter Canadian Solar Technologies spear headed by mechanical engineer, Wendy Maver, who took the best of solar heat transfer technology jointly designed from German based Daimler-Benz Aerospace group and Japan’s Beijing Sundar Solar Energy Technology, and combined them with the best pumps and controllers she could find. Then she set up her own company which she feels rivals the best of the best. That’s pretty big bragging rights for a Canadian gal. We’re not usually so loud and proud about these things, but Wendy feels this product (tested in fair weather places like Germany, Sweden, and the Arctic under hail conditions) can handle itself in the Great White North too. At 74% efficiency it makes sense to heat your hot water through summer and winter including the hot water tank, swimming pool, hot tub, radiant floor heating, radiator or any combination there of THIS WAY. It will cost you somewhere between $7500- 12,000. to do so depending on whether its new construction or a retro-fit and they say it’s proven to last more than 20 years using only a 2 meter by 2 meter space on your roof. I for one think we should give the Canadian girl a chance. You can hook up with Wendy in Delta, B.C. at Tel: (604)721-6565 or go to http://www.canadiansolartechnologies.ca/ for a peek. Norweigan solar power company EnSol has patented a thin film solar cell technology designed to be sprayed on to surfaces such as windows or even the side of a building. Unlike traditional silicon-based solar cells, the film is composed of metal nanoparticles embedded in a transparent composite matrix, and operates on a different principle. EnSol is in development of the product (with help from the University of Leicester’s Department of Physics and Astronomy) and hopes to bring it to market by 2016. Now the whole building would become a power generator. How cool would that be? When thinking about solar power plants usually the image that comes to mind is rows upon rows of panels covering large tracts of desert. Pythagorus Solar however sees it being on the Windows of Skyscrapers creating Vertical Power Plants. Pythagorus Solar’s windows will be paired with Chicago’s Willis Tower, formerly known as the Sears building with its 1451-foot (442 m) height adding up to enough window area to compare to a 10 acre solar power plant. The project will start off a wee bit more modestly of course beginning with the 56th floor. The south side of the 56th floor of the Willis Tower is being fitted with solar windows. A progressive approach to generating solar electrical energy is to apply a form of solar technology to existing highways and the state of Oregon is leading the (err) charge. Although not large in capacity, an interesting first has taken place in the state of Oregon. Construction has started on what will be the first demonstration project of using highways to develop solar power.The project will generate 28% of the electricity needed to power the interchange’s lights and signage. Germany and Switzerland have utilized unused spaces on the side of roads for 20 years, but until now the United States has not done so. In the Nevada deserts of the United States a very exciting experiment is taking place. The government there is seeking to learn if concentrated solar energy might just solve the energy needs of the American people. It’s called the ‘Nevada Solar One Project’ designed by Solargenix Energy and it’s meant to become the largest solar-electric plant built in the last 15 years using parabolic troughs ranging from 14 to 80 MW in size. Concentrating Solar Power (CSP) is a promising renewable energy in this area due to the intense heat of the sun over a large area (a desert). The collected heat (750 degree thermal energy) collected in a field of curved mirrors then focuses that energy onto collector tubes, which in turn creates steam to power electric generators. According to the U.S. dept. of Energy CSP plants covering 9% of Nevada could generate enough electricity to meet the needs of America. Whoa. Where are they gonna relocate Vegas? The basic difference between PV and CSP concentrators to produce electricity from the sun is that one generates it from the sun’s light (radiant energy) while the other utilizes heat (thermal energy). I’d hate to be a way ward (confused) flock of Canadian geese flying south over those things. BBQ anyone? I’d lay money on it that if George Hamilton ever finds out about these things he’ll have a new favourite spot. On 140 acres of unused land on Nellis Air Force Base, Nev., 70,000 solar panels are part of a solar photovoltaic array that will generate 15 megawatts of solar power for the base. The solar arrays concentrate sunlight from the field to a single central tower. These systems use lenses or mirrors and tracking systems to focus a large area of sunlight into a small beam. PV then converts light into electric current using the photoelectric effect. Commercial plants were first developed in the 1980s, and the 354 MW installation is the largest solar power plant in the world located in the Mojave Desert of California. I wrote about this very topic myself recently, and it was great to see your view on it Monica. If you want to find other designs then you can always do a research on the internet and you will find lots of manuals and guidelines on how to make a homemade solar water heater. It is the best option in today’s economic crisis. It is always good to be able to cut expenses and save a little for any other important expenses at home. Fantastic post! I’m just starting out in community management/marketing media and looking to understand how to do it effectively – resources like this post are incredibly helpful. As our company is based inside the US, it’s all a bit new to us. The example above is something that I worry about as well, how you can show your own genuine enthusiasm and share the fact that your product is useful in that case. Solar Energy might be touted as an expensive energy option around the world, but in countries like India, it is being adopted by people at the very bottom of the pyramid. The energy startved rural population of India, has found a bright alternative in Solar. With the help of Solar home lighting system, they can now access basic amenities like proper lighting, fan and options like mobile charging and portable TV’s. There are products like Headway Solar’s Home Lighting System that are briging light to the rural homes and keeping them connected via mobile phones. You can see examples of such system at http://www.headwaysolar.com/solar-lighting.html . Solar is being adopted at the bottom of the pyramid and traversing up the pyramid should not be a difficult job.